Lionfish Backpackers Malapascua v Malapascua Island, Filipíny: Zarezervujte nyní! 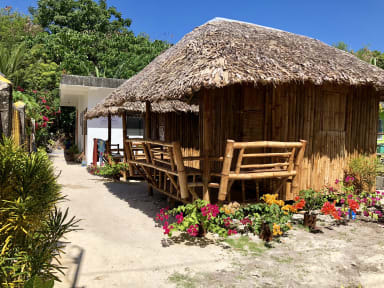 The LIONFISH BACKPACKERS is a newly opened hostel in the island of Malapascua northern tip of Cebu famous for its scuba diving (Thresher Sharks, Seahorses, Mandarin Fish and Lionfish), snorkeling and white sands beaches. LIONFISH BACKPACKERS offers affordable accommodation suitable for budget traveers, barkadas, families and backpackers. We have Two (2) Native Nipa Hut Bungalow good for 2 pax and Two (2) Concrete Dormitories that can occupy 6 guests per dorm. 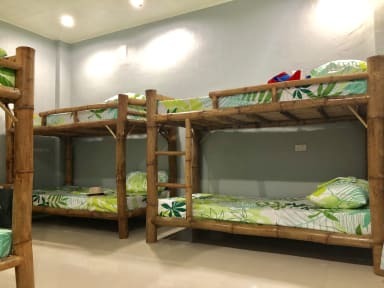 Free linens, comfortable beds and mattresses, soft pillows, heavy duty ceiling fan and electric fan, convertible to be aircon dorms, each dormitory has its own toilets and bath with hot & cold shower. Malapascua is a tiny island situated 6.8km from the offshore the northern coast of Cebu Island. It is a best known for its world-famous diving sites, and the beautiful white sand beach. It is unspoiled and the people are very friendly. You will fall in love with this island the moment you’ll set foot on it. The way to Maya port from Cebu City is via the northern bus terminal, just take a taxi from the airport or a trike from the pier or anywhere close enough in the city itself. The bus to Maya costs 150-200 peso for air-con buses, and travel time is 4-5 hours. You can also take a taxi and that will save you time (travel time is 2-3 hours) but it’s far more expensive (5,000 pesos), but you can negotiate the price down. The way to Malapascua is by a public boat from Maya port. There is a public boat that cost 100P that leaves every time it’s getting full. A private boat can cost between 1500 pesos, so if you’re offered a higher price negotiate. In low tide when you take the public boat, there is a guy in small paddle boats that will take you the short distance to the ferry, and they charge 20 pesos, non-negotiable. The last boat leaves around 4 pm. Once in Malapascua, you can opt to walk for 5 minutes or ride a habal-habal to The LIONFISH BACKPACKERS, we are just located at the back of Malapascua Garden Resort on the way to Bakhaw Kiwi.